For the first time the four men, Ryan Ackroyd, 25, Ryan Cleary, 20, Jake Davis, 19 and a 17-year-old male who could not be named appeared in Court together. They are charged with taking part in cyber attacks under hacking group LulzSec, an offshoot of Anonymous, appeared in court Friday afternoon, appearing side-by-side for first time before a judge. British prosecutors allege that the quartet last engaged with one another under the guises of online pseudonyms to wreak havoc on the web. 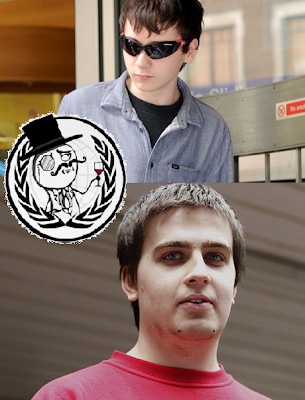 These LulzSec key members are accused of accessing computers operated by News Corp. (NWSA) (NWSA)’s Twentieth Century Fox, Sony Corp. (6758), the U.K.’s National Health Service, the Arizona State Police, and technology-security company HBGary Inc.
Four of the eight counts listed in the updated British indictment today, were levelled solely on 20-year-old Cleary. He is accused of supplying a botnet — or a network of thousands of infected computers that can be used to paralyze websites — to others, and operating one himself to attack the website of DreamHost, a web hosting company. He is also accused of “installing and/or altering computer programs” on computers at the Pentagon controlled by the U.S. Air Force, between May 1 and June 22, 2011. Cleary was the only one of the four defendants who was still in police custody. He was arrested on March 6 of this year — the same day Hector “Sabu” Monsegur was unveiled as an informant — for breaching his bail conditions. According to the new indictment, the four men also targeted denial of service attacks against: Westboro Baptist Church, which has staged anti-homosexual demonstrations at military funerals; the online role-playing game Eve Online; the U.S. Central Intelligence Agency; and Britain’s Serious Organised Crime Agency.